In its third year, 2013 World Retail Congress Asia Pacific is the premier event for global retailers trading in the Asia Pacific countries. With emerging market in the East, at the moment all eyes are on the Asian region. Find out the latest updates and insights to develop and create sustainable business in the ever changing retail landscape. Held at Marina Bay Sands on 19-21March 2013, 2013 speakers include Mimi Tang- Chief executive PPR Luxury Group Asia Pacific / Gucci Group, Michael Hobson -Chief Marketing Officer Mandarin Oriental, Andrew Wu- Group President of Greater China LVMH. 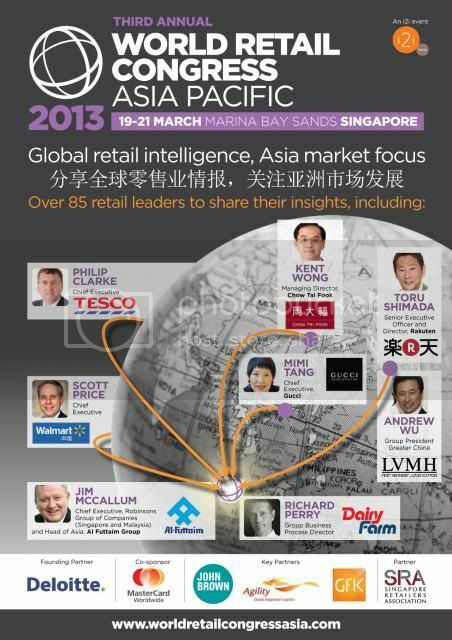 Philip Clarke Cief Executive of Tesco, Scott Price- Chief Executive Walmart Asia, and many more retail leaders. 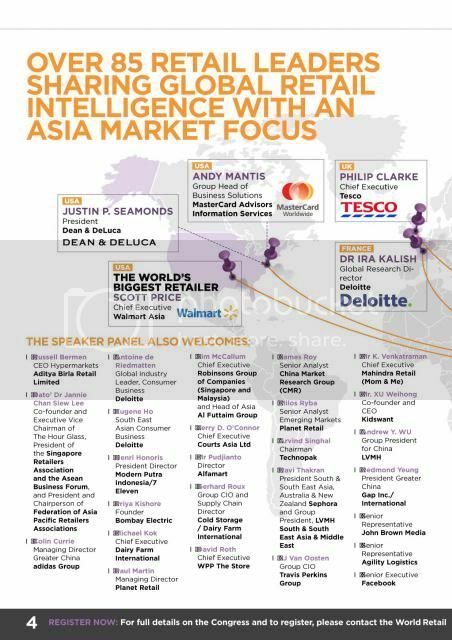 With the tagline of this year's conference: global retail intelligence, Asia market focus, get strategic insights from retail leaders with global expertise. Know the critical economic and market knowledge to set foot in the region. There are also interactive workshops, roundtable seminars, and practical case studies of relevant topics in each session. 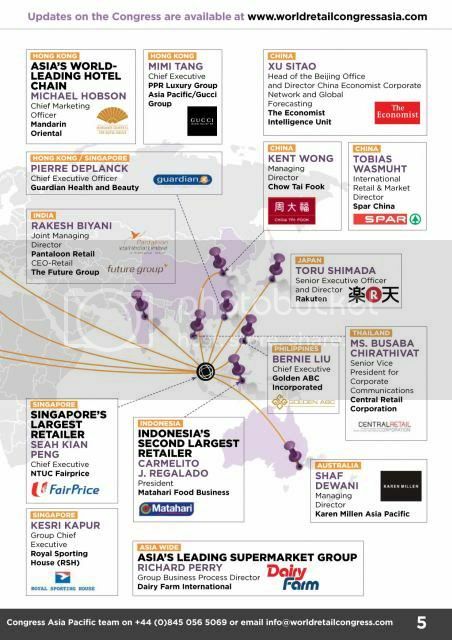 Created in line with rapidly changing and diversifying market across Asia Pacific, this year congress aims to provide global retail intelligence across new channels in the market. Attended by over 600 of the most senior retail leader, this is a networking opportunity like no other. 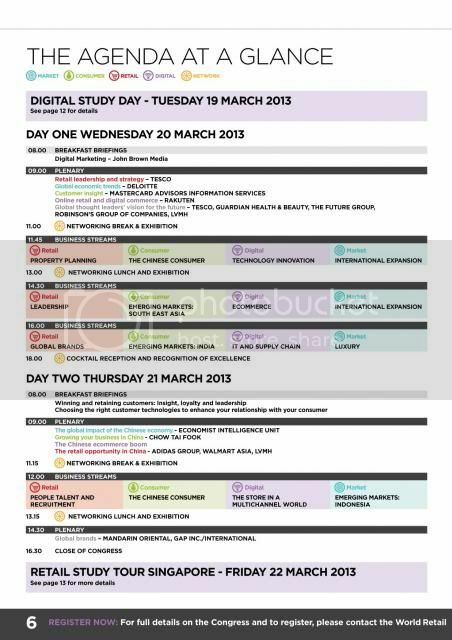 There are plenary session and business streams for each day. Four business streams available to cover latest issue and trend in retail, consumer, digital media, and market growth.